Are they a teaching tool or a distraction? 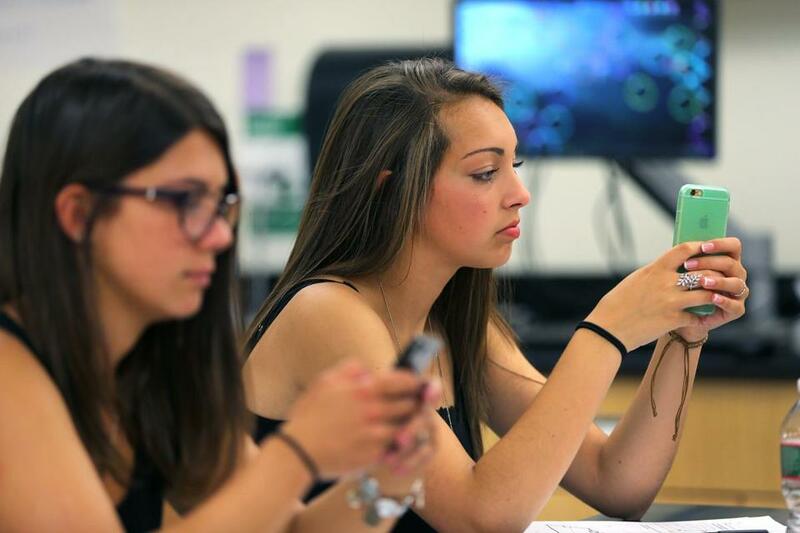 Melrose High students Beatrice Affatato (left) and Miranda Lombardo used smartphones in Blair Cochran’s physics class. After 20 years of teaching, Miriam Morgenstern is calling it quits this month. The Lowell High School history and ESL teacher is starting an educational nonprofit, although that’s not the only reason she’s leaving the classroom. It is the most vexing issue of the digital age for teachers and administrators: What to do about students’ cellphones? Some maintain that smartphones and other devices in schools are crucial to being competitive in a global market, while others insist that phones and tablets distract students, compromising their learning and focus. “You’ll get kids saying, ‘I’ll look something up for English, and while I’m here let me quickly check my Instagram or Twitter feed.’ And then it’s, ‘Oh, I never realized this girl said that to me,’ and now they’re distracted and not really engaged with their lesson plan,” said Joni Siani, a Braintree psychologist and author of “Celling Your Soul: No App for Life,” about how digital media affect young people. It’s a complex issue, especially since the debate over cellphones is part of a broader conversation about a cultural shift underway in classrooms — a move away from the traditional model of teachers imparting information to students, to one where students actively participate in their own learning, using mobile devices to access the Web, educational apps, and other tools. 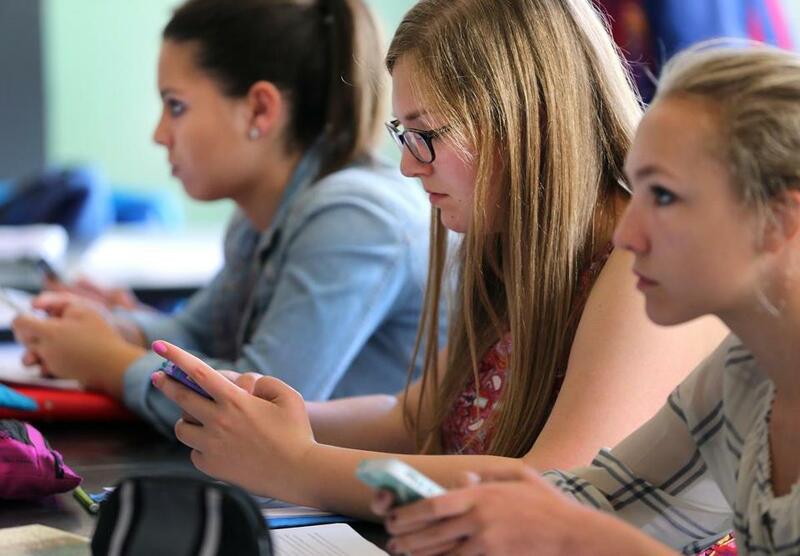 Melrose High School students Nina Gesnaldo (left), Helen Burtnett, and Holly Moore used smartphones to write comments in their English class. At Melrose High School, for example, science students use a physics app to collect acceleration data and measure sound intensity, and English students discuss literature on their smartphones. In Burlington, high school Spanish students practice language skills on their iPads by recording their speech and playing it back. The shift in classrooms is happening slowly and unevenly, depending on district policies, financial means, and teachers’ comfort levels with technology. Some schools are leveraging students’ own smartphones — the so-called BYOD (bring your own device) approach. Others with the means to do so, such as the Burlington school system, have taken the “one-to-one” approach and purchased iPads for all students in grades one through 12. It comes as the era of a one-way lecture — from a teacher who is considered “sage on the stage’’ — is fading. “Undoubtedly there are great teachers with lots of experience who are spellbinding lecturers. I’m not in any hurry to push them out the door, but as they move on, the next generation of teachers will be much better served by the ‘guide on the side’ [model],” said Joe Blatt, faculty director of the Technology, Innovation, and Education Program at Harvard Graduate School of Education. The lack of consensus about cellphone use in schools is reflected in a hodgepodge of policies around Massachusetts. A student logged into a site in Blair Cochran’s physics class at Melrose High. Boston Public Schools prohibit their use during school hours. Melrose allows them in class with teachers’ permission, and the use of smartphones as teaching tools. Some schools permit phones only during lunchtime or in the hallways. Others decree that phones stay inside lockers; some forbid tweets or texts. At Burlington High School, students can carry silenced mobile devices, but using communication features during class is prohibited. Still, the trend seems to be in favor of increased tolerance of cellphones. But banning cellphones entirely can create unexpected problems. Many parents support phones in schools so they can coordinate pickups and after-school activities with their children. They also want to be able to reach them in case of emergency. 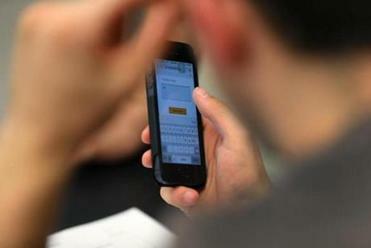 In March, the New York Department of Education lifted its decade-long ban on cellphones in the New York City schools. The ban was unpopular, not least because thousands of students in schools with metal detectors were paying daily fees to vendors to store their phones during school hours. Now administrators will decide for themselves where and how phones will be allowed on each campus. Through it all, the efficacy of mobile devices in the learning environment remains unclear. On the other hand, a study released in May by the Centre for Economic Performance at the London School of Economics looked at 91 schools in four cities in England, where more than 90 percent of teenagers own a mobile phone. The study found that test scores were 6.41 percent higher at schools where cellphone use is prohibited. The researchers concluded that mobile phones “can have a negative impact on productivity through distraction,” particularly among low-achieving students, who benefitted most from the ban, with achievement gains of 14.23 percent. “The results suggest that low-achieving students are more likely to be distracted by the presence of mobile phones while high achievers can focus in the classroom regardless of the mobile phone policy,” according to the study. Many in the pro-technology camp say that students are not distracted if their teachers are engaging, a statement that exasperates soon-to-be former teacher Miriam Morgenstern. She recently brought a Holocaust survivor into class to talk about World War II, and noticed that one of her students was tweeting during the talk. “Should I have told the Holocaust survivor to be a little more engaging?” Morgenstern said.